At Hologic we are dedicated to protecting the reproductive health of women through early, accurate detection of sexually transmitted infections (STIs). The Aptima Combo 2 assay for chlamydia trachomatis (CT) and neisseria gonorrhoeae (NG) offers a unique combination of unparalleled technology delivering the most sensitive test available designed to provide the most accurate diagnosis of infection. Chlamydia and gonorrhea are the most commonly reported notifiable sexually transmitted bacterial infections.1 In the United States there are over 3 million new cases annually and worldwide the World Health Organization estimates the annual incidence of chlamydia to be 105.7 million and 106.1 million for gonorrhea.2,3 The Centers for Disease Control and Prevention (CDC) estimates that only 38% of sexually active young women are screened annually for chlamydia in the United States and that up to 75% of CT infected women are asymptomatic contributing to as many as 30% of CT infections progressing to PID which has been shown to cause permanent damage to a woman's reproductive system including infertility, chronic pelvic pain and ectopic pregnancy4,5,6. Individual Aptima CT and Aptima NG screening assays also available. The Aptima Combo 2 for CT/NG, Aptima CT and Aptima GC assays are FDA-cleared for in vitro diagnostic use. CDC, Recommendations for the Laboratory-Based Detection of Chlamydia trachomatisand Neisseria gonorrhoeae-2014. MMWR 2014; 63. CDC. 2012 National STD Prevention Conference. 2012. National Committee for Quality Assurance. 2012. Thomas A. Farley, M.D., M.P.H., Preventive Medicine, 2003. 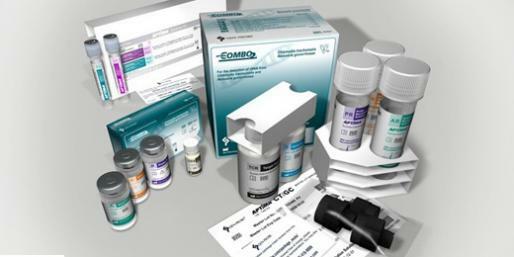 Aptima Combo 2 Assay for DTS and Tigris DTS Systems Package Insert. San Diego, CA: Gen-Probe Incorporated, 2012. M. Chernesky, D. Jang, J. Gilchrist, T. Hatchette, A. Poirier, J.F. Flandin, M. Smieja and S. Ratnam. Head-to-Head Comparison of Second Generation Nucleic Acid Amplification Tests for Detection of Chlamydia trachomatis and Neisseria gonorrhoeae on Urine Samples from Female Subjects and Self-Collected Vaginal Swabs. J.Clin. Microbiol. 2014;52(7): 2305. M. Chernesky, D. Jang. K. Luinstra, et al. High Analytical Sensitivity and Low Rates of Inhibition May Contribute to Detection of Chlamydia trachomatis in Significantly More Women by the Aptima Combo 2 Assay. J. Clin. Microbiol. 2006;44(2): 400-405. Piper Jaffrey Investment Research, Sixth Annual Molecular Diagnostics Update, June 2011. Sannes & Associates, Inc. CT and GC Testing Market Report, January 2011. J.L. Yang, J. Schachter, J. Moncada, D. Habte, M. Zerihun, J.I. House, Z. Zhou, K.C. Hong, K. Maxey, B.D. Gaynor and T. Lietman. Comparison of an rRNA-based DNA-based nucleic acid amplification test for the detection of Chlamydia trachomatis in trachoma. Br. J. Ophthalmol. 2007;91:293-295. S. Chong, D. Jang, X. Song, J. Mahony, A. Petrocj. P. Barriga, and M. Chernesky. Specimen Processing and Concentration of Chlamydia trachomatis added can Influence False-Negative Rates in the LCx Assay but not in the Aptima Combo 2 Assay when Testing for Inhibitors. J. Clin. Microbiol. 2003; 41(2): 778-782. M. Chernesky, D. Jang, K. Luinstra, et al. 2006. High Analytical Sensitivity and Low Rates of Inhibition May Contribute to Detection of Chlamydia trachomatis in Significantly More Women by the Aptima Combo 2 Assay. J. Clin. Microbiology 44(2): 400-405.